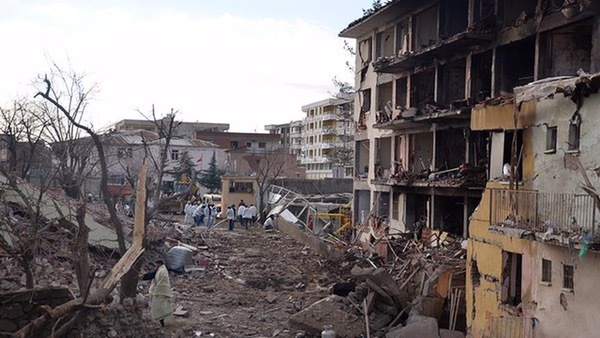 Five civilians, including a five-month-old baby, were killed in Wednesday’s car bomb attack on a Turkish police facility, the prime minister has said. The incident took place in the Cinar district of Turkey’s southeastern Diyarbakir province at about 11.30 p.m. (2130GMT), Diyarbakir Governorate said in a statement. A policeman is also among the dead. Diyarbakir Governorate – which blamed the terrorist organization PKK – also said shots were fired at police during the assault. One building collapsed due to the force of the blast. Search-and-rescue teams retrieved the bodies of three people and saved five others trapped under rubble. A total of 20 other civilians were injured as the blast damaged nearby houses. Turkish Prime Minister Ahmet Davutoglu confirmed the five civilian deaths and said 39 people, six of whom were security force personnel, had been hurt. Some of the dead and injured are family members of police officers who were living in lodgings at the facility. “I strongly condemn the attack,” Davutoglu told a meeting in Ankara, offering his condolences to the families of the dead civilians and a speedy recovery to those injured. The prime minister reiterated that terror was the “enemy of humanity” and called for a united stance against terrorism. “As Turkey, we will continue our fight against every kind of terrorism… While sustaining our fight against terrorism, at the same time, we are resolved to eradicate the resources terrorism feeds on,” Davutoglu added. Medical treatment of the injured is continuing in nearby hospitals, said the governorate. The PKK – considered a terrorist organization by Turkey, the U.S., and EU – resumed its 30-year armed campaign against the Turkish state in late July. Since then, more than 200 members of the security forces have been martyred and thousands of PKK terrorists killed in operations across Turkey and northern Iraq.